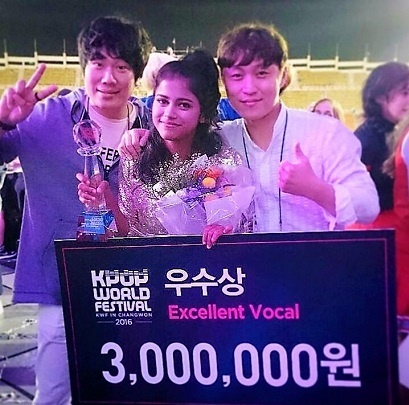 Meet the Teen who won the Third Place at K-POP World festival 2016 in Changwon. Third Place at K-POP World festival 2016 in Changwon. Music has always been her best companion and has been listening to all genres of music but K-POP craze happened only when she watched K-dramas when she was around 16. What got her addicted is even more interesting - One Song did the trick !! Taeyeon’s song, titled, ‘MissingYou Like Crazy’ (Taeyeon, Leader of Girl group –Girls’ Generation), & then Davichi & ofcourse BTS. They sang with deep emotions, their mesmerizing voices, the soothing lyrics (though she didn’t understand the language), the stage performance was presented in such an attractive package that she instantly fell in love with every thing Korean. She chanced upon the Korean Cultural Centre-India’s page and then started to prepare for the contest. At the end of her 12th boards, she wanted to contest. 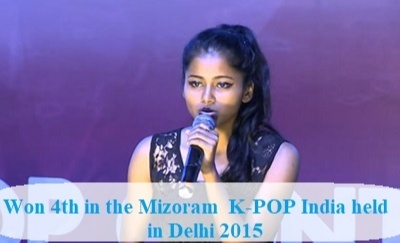 She was selected via the online video auditions and she comfortably won the Mizoram round and came 4th in the K-POP contest India held at Delhi in 2015. 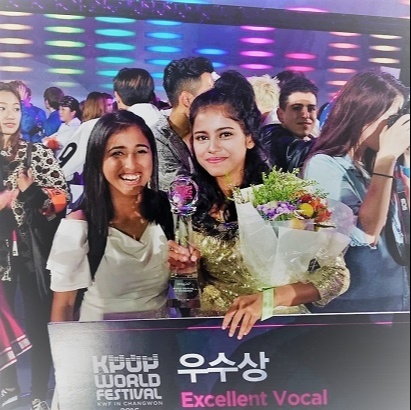 Pursuation got the better of her and she re-tried in 2016 where she won the First Place at the All India K-POP contest in Chennai. Not everyone who wins at the national level gets to participate in the K-POP World Festival held in South Korea each year. There are stringent online rounds to qualify where videos are required to be sent to South Korea (KBS). Priyanka comfortably cleared all the qualifying rounds to be adjudged the one to Represent India and became the first Indian to do so. 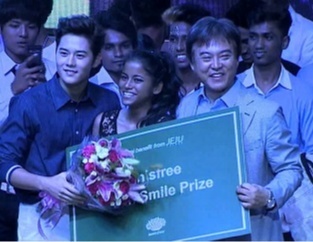 She was amongst the 15 final contestants from 15 different countries. Priyanka Mazumdar a small town girl from Assam, an introvert, spent sleepless nights, suffered from anorexia, vomited what she ate because of her intense schedule at college. To add to her misery, she had to get her passport done, send documentary videos to KBS, give interviews. She struggled with stage–fright, meeting strangers, stepping foot on foreign shores for the first time, knew a bit of the Korean language.etc., Despite all her hurdles, she practiced what she could and began to calm down and be brave. Ready for the BIG BIG Stage. Despite making her feel warm and comfortable by the South Koreans at her arrival, she still felt lonely and nervous. All she told herself was “I have come this far and I must give it my best” and there she was on stage where she got a standing ovation for her scintillating performance. She was satisfied with what she did but says there is always a room for improvement. 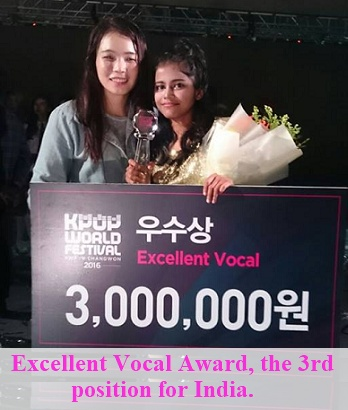 Back home the Indian frenzy K-POP lovers were exhilarated when she was awarded with the Excellent Vocal Award, the 3rd position for India. Even more memorable was to share the same stage with her idols BTS, TWICE, Monsta X, EXID, ASTRO etc., meeting idols like 2 PM, Secret Song Jieun, JustJerk, DJ Koo. What a super duper successful and a memorable trip this has been for Priyanka who will cherish the memories for a long long time to come. The preparation for the journey was even more difficult as she didn’t have anyone to share her feelings or ask for suggestions & guidance about K-Pop. None among her friends or family knew anything about K-Pop. She learned K-Pop singing just by observing and listening to the Korean idols & practicing the songs in her closed room. Everything she knows is from the internet and even picked up the language watching K-dramas and movies. Priyanka was an ace swimmer and moved to the Sports Institute in 2015. Her daily routine was hectic with no time left for anything. In any case, there were no cell phones nor internet and hardly got any time to practice. Despite the shortcomings, she never gave up and tried to practice and prepare whatever she could. K-Pop is Korean pop which means everything is in the Korean language. K-Pop is a bit different from the western music we hear as K-Pop idols perform by singing and dancing at the same time. It's not that they just groove to the music, but they actually dance in choreography. The idols in the K-Pop industry are trained under the entertainment labels or companies from a very young age (even like 4-5 yrs of age), until they debut in a group (boy-band/ girl group, or duo). Solo debuts are comparatively less, & comes after they are successful with their group. K-Pop idols sing, dance, rap, act, compose & write songs, play instruments, produce music, host shows (MCs, Radio shows, VJ etc). Basically, K-Pop idols are trained as a whole package of entertainment for fans. The idols’ training maybe as long as a decade or just a few weeks depending on their potential. Their hard work is showcased in their stage performances, which are attractive, enjoyable, and unique. K-Pop idols have their own fandom names, own fandom Lightsticks (for concerts) & idols remain connected to their fans through frequent fan sign events, reality shows, apps & websites, and fan-cafes, sharing the daily lives of idols. What is she up to now. Now that she has the fame, she is back to pursuing her Bachelors’ in Physical Education from LNIPE (Lakshmibai National Institute of Physical Education), Sonapur, Assam. Since she is a national swimmer and loves any kind of sport, this was the best option. Of course, her love for K-POP will never die. Yes, if not for her parents who pushed her into a 50-meter pool when she was just 2 years old, she would never have taken the swimming path and become a national swimmer. Her childhood is nothing special except Swim-Eat-Sleep and repeat the same but she thoroughly enjoyed doing it. Her greatest strength comes from her father who is funny but strict, very hardworking, active, strong, smart and her ever loving and caring mom. Her sister swimmers too have inspired her and the trio are more like friends. There was plenty of support from her parents all through her life and they were pleasantly surprised to know her musical talent and are happy for her. At a young age of 17 one really need not go through this treatment. First & foremost: insults, comments, disgusted looks by the people who thought K-Pop is a Gay/ Alien music/ Noise/ and what not. Endless complaints from neighbors, & people asking to stop wasting time on these “Gay stuffs”. Other challenges she has faced include, lack of guidance, lack of knowledge about K-Pop & Korean culture, language barrier, training, financial problems, demotivation, etc. Many have remarked in a derogatory manner like “She must have paid money to the organizers!”, “This is easy, it’s nothing compared to Indian singing contests, Indian Idol, etc”, “money can buy everything”, few cursed media saying “I guess media has forgotten about Assam & India’s culture that they are covering K-pop stories!”.People wanted her to sing local language songs or Bollywood and neglected K-POP. When she got back to India after the World Festival, instead of appreciating, people asked about the prize money she got and isolated her saying, “oh, here comes the rich celebrity. She will not talk to us anymore” and left on their own, making her look like somebody with an attitude problem. She was good academically too and people couldn’t digest the fact that she had so much talent and started spreading false rumours about her character. Life is full of Challenges and she brushes aside what affects her and carries on to excel in whatever she does.